Our house in Enchanted Meadows (that is the actual name of the area, you couldn’t make it up!) in Anchor Bay, California is the perfect place for a couple or a small group of family or friends to get away for a few days. It sits on top a hill along famous Highway 1 on the coast. Because Enchanted Meadows is located in the so called banana belt, the weather is warm and sunny even if much of the coast is covered in fog. The main house has a living room and dining room with hardwood floors, a fully equipped kitchen, one bedroom, a large newly remodeled bathroom with floor heating and a huge deck around the house. Two additional buildings serve as two more bedrooms, one with a bathroom. 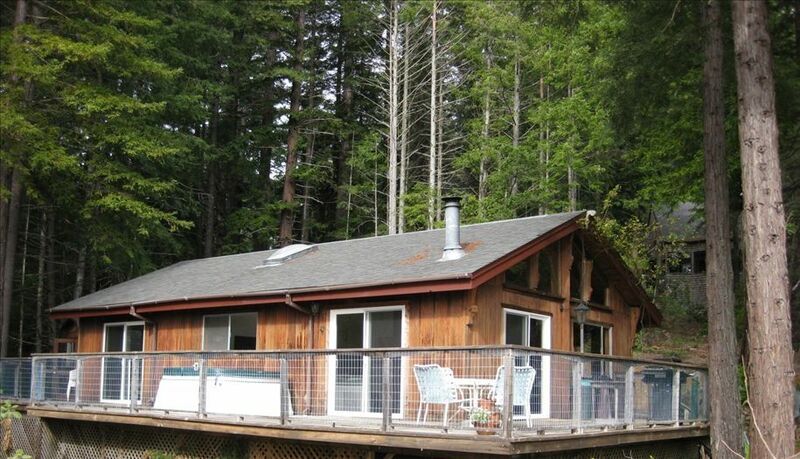 The house sits in a Redwood forest with a partial blue water ocean view. You can hear the waves and sea lions from the house. The setting is very private, calm and romantic. The deck and garden are perfect for hottubbing, relaxing, sunbathing, enjoying meals or watching the local wildlife. You will most likely meet the local bevy of quail, watch the hummingbirds dart around the garden, hear the ravens in the trees, see the chipmunks and squirrels and maybe get a glimpse of a deer. One of the most wonderful features of the house is the light. In the morning the whole house is flooded with warm morning light. Watching the full moon from the hot tub on the deck or through the windows inside the house travel across the night sky is spectacular. And without the moon, the sky is exploding with stars and planets, an amazing experience from the comfort of the hot tub. For city dwellers the lack of light pollution is awe-inspiring. In the winter, the wood burning stove in the living room will keep you warm and cozy. Though you feel like you are away from it all, you are very close to civilization. Anchor Bay is just 5 minutes down the hill and offers a supermarket and two restaurants. Gualala is about 10 minutes to the South and offers a wide variety of restaurants, two supermarkets, a post office, gas stations, gift shops and live music. Gualala is about 10 miles north of Sea Ranch, Sonoma County. The spectacular Mendocino coast and its beautiful beaches are a great place to explore, hike, fish, dive and surf. Our house is a short drive to the Point Arena Cove and the Point Arena Lighthouse which offers some of the best whale watching on the entire West coast. Our house in Enchanted Meadows is our personal vacation home, but we enjoy making it available for you to rent. John and I spend as much time up there as we can because we love the area. The Mendocino Coast is an easy place to fall in love with; you should try it! If you have to ask, you need to come visit the area! It is paradise. This stretch is one of the most amazing parts of the California coast. It is rugged and offers any outdoor loving person unlimited possibilities. Our property is at the end of the road, which means that you are looking out on the ocean and trees. The hill is South facing and offers a unique sunny, windless and warm climate, the locals call it the Banana Belt. The bathroom in the main house is spacious and has floor heating which is wonderful especially in the winter. It has a large shower, single sink and toilet. The small bathroom in the Hummingbird House (downhill cabin) has a shower, sink and toilet. In addition to the wood-burning stove, the main house has two wall heaters in the dining/living room and the bedroom. The two cabins have electric wall heaters. We provide European style bedding with down comforters and duvet covers. All linens are washed after each visit. You are not required to do laundry, that is part of your cleaning fee. We finally got wifi! We just had a HughesNet Dish installed and it works great. We provide towels for the house. Please bring additional towels for the beach and try to avoid bringing sand into the house. The living room has a 3-seat sofa and 2-seat loveseat. We provide some basics, but you need to bring your food. No perishable items may be left behind in the house. The house has a huge wrap around deck that is ideal for outdoor meals and soaking in the hot tub. On the deck. Ideal for sky gazing. My husband and I thoroughly enjoyed our stay in this lovely cabin. I've stayed in many rentals over the years in different areas of the USA and this is by far my favorite. The location was private but not too remote. The space, furnishings and amenities were outstanding. It was a great value. Katrina was prompt and thoughtful in all our correspondence. We highly recommend this cabin for couples and if you have a larger group you can rent two more cabins on the property. I especially liked the spacious bathroom with heated floor, great lighting and storage cabinet. Hot tub was relaxing even in January weather. Thank you Katrina!!! Charming, super clean, quiet and comfortable. The hot tub was great for chatting and star gazing at night. In the morning, waking up to a nice cup of coffee on the deck and gazing out through the trees to the ocean was a lovely way to start the day. The owners made themselves available if needed but all the instructions were straight forward. We would love to come again someday and highly recommend this nice place! Just what we were looking for to spend some fun time with our son and his wife for a couple of days. Everything was as advertised. Very good instructions for everything. Really loved the wood stove, especially since I grew up with a wood stove as our only source of heat, so made me feel right at home. While we were hoping for clear nights for star gazing, the rain did allow us to spend more time with our family playing games inside the cabin. We could see ourselves staying here again for sure! I would recommend bring a pluggable night light if that is what you are used to. Otherwise you can just leave the kitchen light on to provide light for those night time bathroom trips. The 2nd cabin worked perfectly so each couple could have their privacy and also made getting ready in the morning go much faster. Katrina is wonderful at communication! The home is a true getaway with distant sounds of the ocean, nestled in redwoods, with a full and wonderful canopy of stars at night! We will go back. We love the Gualala/Anchor Bay/Pt Arena area, and this place is a great jumping off place to find more great views and lovely beaches, but honestly all we wanted to do was to hang out. On the clear day, we saw the ocean from the deck and stars galore at night after grilling out, and on the foggy days the hot tub was my favorite feature (well actually it was my favorite, fog or no). The kitchen is well appointed and the heated bathroom floor is a nice touch. I only wish we had more time up there. The $70 cleaning fee is for the main house only. Cleaning for two or three buildings is $90 due to very high water and utilities rates.